As part of Urban Science, it’s in our blood to question everything. Not only do we look outside the box to solve complex problems, but we then question each element that makes up the box, down to each individual line, 90-degree angle and the composition of positive and negative space that define the constraints of the box. Better yet, approaching a problem from a true scientific perspective means questioning why the box even exists in the first place. While the process can be painstaking, making observations through the unbiased lens of science can also lead to accidental discoveries. Granted, for someone who started in the business as a car salesman and later managed dealerships, using scientific methods to make decisions in the showroom isn’t the first and most natural inclination for many of us. And when I say science, I mean actual science – not the junk out there that claims to be science (remember when everyone threw around the term “big data”), but the kind of science that has no skeptics, that sees trends within a data set that not only others don’t, but that no one’s even thought to look for before. When we hear a number or statistic over and over again, especially one published by a known source, we believe it to be true because…why wouldn’t we? We all know not everything we read on the internet is true, but this example is perhaps the ideal case in point of one widely accepted “truth” the automotive industry has come to accept without any empirical evidence whatsoever. Automotive leaders in search, analytics, digital advertising and consumer behavior have all published findings stating the number of dealerships customers visit before purchasing a vehicle is somewhere between 1.3 and 1.6 dealerships. This number has been kicked around at conferences for years. So naturally, we decided to challenge the claim that customers visit less than two dealerships before buying a car. In May of 2018, AutoHook and Urban Science decided to conduct our own survey. We asked real consumers we know bought a car within the last year how many dealerships they visited prior to their purchase. Out of 2,748 responses, what we found is people are visiting more dealerships than we thought. According to the survey results, people on average visit at least 2.4 dealerships before buying a car. Furthermore, 70% of customers surveyed visited two or more dealerships before purchasing. Almost half, 46% to be exact, said they visited three or more dealerships before purchasing, and 26% said they visited four or more dealerships. The unfortunate reality is that we’ve all been thoroughly brainwashed with the misconception that people only go to about one dealership before buying a car which we now know is not the case. Regardless of whether customers visit two dealerships or five dealerships, the takeaway here is that everything we’ve been told about consumer buying behavior in the digital age is skewed. The truth is that today’s car shoppers go to at least 2 dealers before purchasing. What’s so significant about this finding is that it proves people have a choice and decisions are being made both on AND offline. The blindly accepted notion that the majority of car shoppers have already made up their mind on what to buy and where to buy before ever stepping foot in a dealership is completely false. In fact, in another study completed by AutoHook and Urban Science, 78% of over 66,000 respondents said they were still shopping multiple brands before visiting their first dealership. The underlying message we’ve all come to believe is that customers are making buying decisions based largely if not solely on what they read online…which by the way conveniently plays to the ultimate gain of the big publishers, search and media companies. Maybe they are doing this so dealers and OEMs will continue to spend more and more money with said companies on their digital advertising, but we don’t have the science to back that up just yet. Anyways, down here in the real world, cars are still bought and sold in physical showrooms and the process is still dependent upon a positive exchange between two living, breathing people. The only difference between today and 50 years ago is that customers walk in armed with information and salespeople need to provide a less painful buying experience. Other OEM-specific customer surveys AutoHook conducts on an ongoing basis show that when asked why they didn’t buy a car from a particular brand, the overwhelming majority of respondents selected “bad dealership experience” as their #1 reason for not purchasing. So, if you think people are going to fewer dealers than they were ten years ago, it may be because the experience they expect to have when they’re at a dealership is a negative one. Not always – I know plenty of dealers who recognize the importance of their people and the in-store experience they provide, and I also know these dealers sell much more effectively as a result. This alone makes the argument that dealers need to focus more attention on hiring and retaining better salespeople who understand the value of relationships if they’re interested in repeat, loyal customers. Another common misconception is that millennials are taking over the market and they buy everything online; therefore dealers need to move towards models where ~99% of their selling happens online, and their salespeople just need to walk the customer through the paperwork upon arrival. The first part of that statement is true in that Millennials are quickly overtaking the market as they now account for almost 30% of all new vehicles sold. By 2020, JD Power and Automotive News project they will account for 40% of all new vehicle sales. What’s NOT true is the assumption that Millennials want to buy their cars online. In fact, it’s the exact opposite. The test drive experience is more important to the Millennial generation than ever before, so much so that they want to extend the test drive experience to get a solid feel for how a vehicle will fit into their everyday lifestyle. Millennials also spend more time on the buying process and are less brand-loyal than previous generations. As a result, we see more and more extended test drive programs popping up like Toyota’s Try Before You Buy program which allows customers to take home a vehicle of interest from anywhere between 24 hours to a full week. Again, whether the total number of dealerships visited before a purchase is 2.4 or 3.4, the more important point is that people have choices and if they go to a dealer ready to buy and have a negative in-store experience I can confidently say based on data (and common sense) that they’re going to leave and buy from someone else. I’m not saying everything we know about digital is dead, and I’m in no way trying to tell dealers to kill or even cut their digital ad spending. But what I am saying is we as an industry need to seriously reevaluate the amount of time, energy, and most importantly, money we spend on what we know is vital to selling cars and the ongoing growth and success of a dealership…good salespeople. There is this perpetual echo of the word “disruption” in the car industry. What will be the next big disruption? What do we need to prepare for that will change everything we know about selling cars? The reality is disruption is largely incumbent upon technological advancements and the rate of societal adoption to these new, uncharted territories dominated by things like artificial intelligence and machine learning. These future “disruptors,” such as the rise of alternative online retail formats, subscription services or the transition from gas-powered vehicles to autonomous, connected cars are impossible for any one dealer or OEM to predict, let alone control. Therefore, I’d like to propose a new approach. What if instead of the next big disruption we focused a little more on what we can control – the constants – the parts of the equation that aren’t powered by data or machines. What I mean by the constants is the people, or more specifically, the relationships that form when a customer goes to look at a car and has a positive interaction with a salesperson while doing so. The value of relationships when it comes to selling cars has been vastly undermined by the shiny new innovations of the digital age. I think we’ve become so infatuated by the latest technology and the newest cutting-edge solutions to selling cars that we forgot about the fact that technology becomes useless without the people behind it who make it work. Relationships in the digital age still take precedence over technology and despite the advancements we have yet to see, technology in all its glory can’t replace social skills. All this talk about connectivity and connected devices yet I think we’re failing to connect the dots when it comes to knowing what will ultimately yield the highest ROI for dealerships, both in today’s world and in the future – knowing who your best salespeople are and how to keep them. We as an industry need to stop using technology as a crutch. We’ve become so focused on the next big disruption in digital marketing that we’ve started to rely on the help of digital tools entirely, forgetting that cars are still bought and sold by actual people at actual dealerships. Deloitte’s 2018 Global Automotive Consumer Study reported car shoppers still rate physical interactions with a vehicle as critical to their buying decision – with over 8 out of 10 needing to see the vehicle in person before making a purchase decision. So, if this is the case, why are we spending the majority of our time and money on the minority of the buying public? It’s all about striking a perfect balance between technology, the right data and the right people. It takes all three to get the job done. Technology is a powerful tool that can be leveraged to enhance or continue existing relationships, but it can’t create them in the first place. When it comes to the right data, we are extremely fortunate because our solutions are powered by the Urban Science® DataHub™, which allows us to be the first to know when a customer buys a car, what car they bought, where they bought and if they didn’t buy from you. And we get that sales data and the equally important defection data within days – not months. In the same way that technology lacks value without good people, the right data can uncover things about your salespeople you otherwise never would have known. For example, you consistently see all these closed sales opportunities by let’s say, “John,” so naturally you think John is one of your best salespeople. But how many opportunities is John losing every month to one of your competitors? You’d never know without the right data. So it all goes hand-in-hand. The person selling the most cars may be losing more opportunities than he or she is closing, so your “best” salesperson can quickly become your worst salesperson when you can compare what they’re winning to what they’re losing at the same time. Having that ability to layer sales and defection data on top of your CRM data is critical if you want to operate more efficiently. Without it would be like making decisions for your dealership based on a cost-benefit analysis but forgetting to include the cost part of the equation. It’s the only way to add enough dimension to your CRM data to make it truly actionable – instead of looking like Flat Stanley. Having the right data combined with great technology can help your operations in a multitude of ways. It can suppress the leads in your CRM that have already purchased so your people can stop wasting time following up with them. It can pinpoint the ideal time and channel to re-engage your lapsed or dormant leads. Technology can help dealerships interrupt a customer while they’re shopping online and grab their attention just long enough to influence their decision-making process. It can also help ensure a customer chooses to visit your showroom instead of your competitors with things like test drive incentives. The reality is technology will never be able to stop a customer from walking out of your dealership after a negative experience with one of your salespeople. Furthermore, when it comes to closing lead opportunities, your salespeople may already be at a disadvantage. A recent Automotive News dealer training webinar reported that as many as 98% of qualified leads fail to result in closed business. So instead of pouring all your focus into staying ahead of the next big disruption promising more and better leads, maybe we need to shift our focus back to the one thing capable of converting those leads into sales once they hit your showroom – your people. Great employees are what gives meaning to the capabilities that stem from great technology. Your salespeople are the foundation needed to ensure data-powered solutions work in favor of your dealership. In a word, the future state of our industry’s digital landscape is unpredictable. But there are two things we do know. Change is constant and retaining great salespeople is still paramount. There’s not a lot we can do to control the rate of change, but fortunately for dealers, there’s a lot we can do to help our salespeople and to make sure we're holding on to the good ones. Stay tuned for Lies the Digital Age Told You About Selling Cars, Chapter 3: Power to the [Sales] People to learn more about the importance of retaining your best salespeople and how to provide a better in-store experience. I could go on for days with stats like this, but we have more important things to discuss - such as how to change the current perception. The upside to all the negativity around car buying is that we have A LOT of room for improvement. And dealers aren’t necessarily to blame either. The problem is, what we’re told about consumer behavior in the digital age compared to what car buyers themselves actually do in the digital age are often two very different things. We live in a constantly connected, convenience-based universe inundated with unsanctioned opinion and as a result, we’ve become conditioned to rely on technology to solve problems. We know the in-store experience is important, but we’re too fast to look to the latest technology to solve the problem rather than focusing on what we can actually control. Not just something dealers have the power to influence, but also something that may ultimately yield the highest ROI out of any available technology in the market…which is your salespeople. How did I come to that conclusion? Funny you should ask. In the article, “What’s the REAL Cost of a Bad Salesperson?” I dissected the monetary difference between what good salespeople can contribute to your dealership over time versus what just one bad salesperson could cost you. A salesperson selling 15 cars a month yields about $270,000 a year in gross profit. Then when you factor in the lifecycle of the vehicle and any potential service revenue associated, you’re looking at a minimum value of $325,000 a year in pure gross profit for any one good salesperson. Read the blog if you don’t believe the numbers. Now consider the reverse. One salesperson that loses 15 sales a month to one of your competitors is costing your dealership $325,000 a year in gross profit. Multiply that by just four people and you’re looking at $1.3 million in lost gross profit a year. But here’s the kicker. Without the right data processed through the right technology, you would have no way of knowing how many customers your salespeople interacted with that left and bought a car from someone else. Perhaps due to a negative experience? A recent study from Cox Automotive suggests that initial experience may be more important today than ever before. The rate of car buyers returning to dealerships where they have previously purchased or leased from is increasing. 40% of new vehicle buyers in 2018 are repeat dealer customers compared to 31% in 2016. This is great news, but it puts even more pressure on getting it right for that first-time buying experience and, in most cases, your sales team is directly responsible for it. Customer loyalty and the chance of them coming back to buy a second or third car depends on the experience your dealership provides them with upon arrival. So your people better be armed and ready. There is a seriously infinite amount of opportunity for improving your dealership’s operational process, and it starts with your people. Dealers don’t have time to guess who their good and bad salespeople are – that’s where the technology comes in. You can’t retain good salespeople if you don’t have the technology to know who they are. The right technology can tell you who is letting the most opportunities walk out the door. It can tell you which leads your people are struggling with and the exact time frame during the month they struggle with the most. There’s a lot technology can do to help your people and to enhance the car buying experience, but it can’t drive the car buying experience entirely. At least not before flying cars become a thing. So before your brain explodes from all the numbers and reporting being thrown at you during any given moment, or from all the external pressure you’re getting to improve 50 different KPIs at the same time, remember that your people are what gives meaning to the metrics. Retention, should be your absolute number one focus and priority in the digital age – and that applies to both your salespeople AND your customers. Running a successful dealership ultimately translates to retaining good salespeople, but you need the help of good technology to be able to do that. Ironic, I know. Stay tuned for the upcoming fourth and final chapter of Lies the Digital Age Told You About Selling Cars: The Executive Edition. Dealer Managers will learn real-life examples of how to apply new technologies to directly support the success of your salespeople instead of relying on technology to do the selling for them. The more you can do to help your employees be successful at your dealership, the more likely you are to retain them, which ultimately leads to everyone’s mutual benefit – not to mention the benefit of your bottom line. In Part I of Lies the Digital Age Told You About Selling Cars, we overturned one of the most blindly accepted industry-wide standards about the current state of consumer car buying behavior. For far too long, the assumption has been vehicle shoppers have everything they need to make a purchase decision online, and they already know what they’re buying before ever stepping foot in a showroom. The common misconception has been that the average consumer in the digital age only visits one dealership before purchasing a vehicle. What we found after surveying 2,748 U.S. consumers that have purchased a car in the last year is that the above statement couldn’t be further from the truth. In reality, not only does the average customer visit at least 2.4 dealerships before making a buying decision, but almost half – 46% – said they visited three or more dealers before purchasing. Over a quarter of our sample size, 26%, said they visited four or more dealerships before buying. All of this data was collected by AutoHook and Urban Science in May of 2018 from people who purchased or leased a vehicle within the last year – not from a published study conducted five years ago. As a former general manager of a dealership, CMO of a privately-held dealer group and as a marketer in general, I found the fact that roughly 1 in 4 people (26%) in the year 2018 visit four or more dealerships before buying a car to be personally absurd. Though surprising, this statistic solidified a new truth about the state of our industry. Contrary to what dealers have been told, the in-store experience is arguably more important in the digital age than ever before in the history of the car business – and for several reasons. The most prominent reason being if a customer has a bad experience with one of your salespeople when they come in for a test drive, they will leave and buy from someone else. If they go to two dealerships and have a bad experience at both, they will go to a third and even a fourth dealer to buy from the one that provides them with the experience they expect and deserve. Just like everything else that has surfaced from the digital age, car shoppers have a LOT of choices when it comes to what they’re going to buy and who they’re going to buy from. Purchase decisions are still made at physical dealerships, most likely following a test drive – NOT exclusively online. Shoppers in-market for a new vehicle don’t have their minds made up about what they’re going to buy by the time they visit their first dealership. Outsell says 6 out of 10 car shoppers enter the market unsure of what they want to buy. Our own research and survey data consistently shows 78% of people are still considering multiple brands by the time they visit their first dealership. So we as an industry, we HAVE to get this right. Instead of operating based on pure, often biased assumption, dealers need to seriously reconsider their order of priorities in terms of how they run their business and where they spend their money. The digital age has armed us with so much intellectual power, yet at the same time, it’s made us a little lazy. It’s cast a shadow over what’s really important – defining value and personal worth by likes, clicks and follows rather than interpersonal relationship skills. Part II of Lies the Digital Age Told You About Selling Cars verified the auto industry has become too quick to rely on technology as a crutch to do the work for us, rather than picking up the phone and having a conversation - or dare I suggest having the inventory knowledge and social skills to not only sell a car, but to foster ongoing relationships that lead to repeat, loyal customers. It is officially time for a new dialogue to emerge. The question we as an industry need to be asking is not how can we leverage new technologies to help us sell cars, but how can we leverage new technologies to help our salespeople sell cars? Rather than answering the above question based on my expertise and years of experience in this business, I’ll share the real-life success stories of how two actual dealerships in the digital age are using great data processed through great technology to help their people sell more cars and lose fewer opportunities. One of our dealer clients needed an accurate way to measure the true effectiveness of their follow-up process by knowing what was and wasn’t working within their current lead mix as well as how many opportunities their salespeople sold compared to how many they lost to competitors. Using their individual salesperson data, we analyzed each person’s sales and defections and identified who had the most potential to improve. We then pinpointed the time frame during their follow-up process when their people struggled the most, which for this particular store was during days 0-4 after a lead hit their CRM. Lastly, we exposed their highest defecting lead source. Armed with a roadmap highlighting their greatest areas of opportunity, the owner of this dealership shared this data with his sales staff and reviewed each person’s sales and defection trends with them one-on-one every month. He created an environment of transparency and friendly competition by making this defection analysis technology available to all his salespeople, thus holding them personally accountable for every sale they lost in addition to what they closed. The dealer then helped his staff implement a more aggressive follow-up strategy for working leads 0-4 days old. He provided additional training on how to better work leads that came from their highest defecting source (especially during this time frame). He took the time to listen to feedback from all his salespeople and found opportunities for peer coaching to help further reduce their collective number of defections. He also implemented a system to reward the people who showed improvement each month. Their overall defections decreased by 89%, with a 44% decrease in defections specifically during days 0-4 post-lead. They increased their number of closed sales tied to their highest defecting lead source by an astounding 242%. 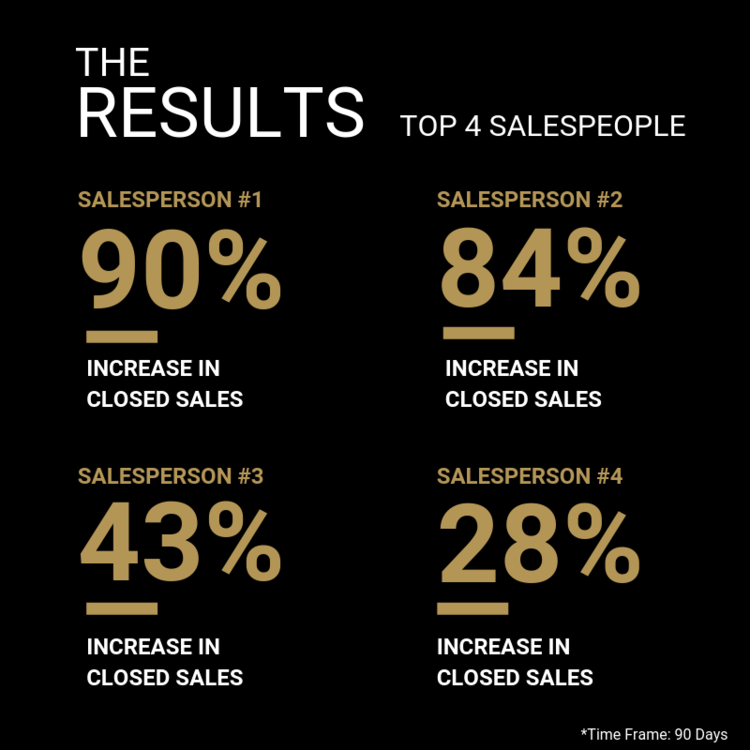 Most importantly, when it came to the salesperson identified as having the highest defection rate, that individual successfully increased their closed sales by 78% and went from being the worst performer on the team to one of their top performers. This store needed a way to identify any potential problems with their lead mix to see which sources were underperforming and why. Using the same defection analysis technology as Dealer #1, they were able to determine the issues they were having with their highest defecting lead source were due to external factors outside of their control – rather than a lack of effective internal follow-up. They then confidently decided to cancel this lead provider and put those marketing dollars back towards their bottom line. Ninety days later, they saw a 61% average increase in salesperson performance after removing that lead source – not to mention they were able to free up a total of 40 man-hours per week that were previously devoted to working those high-defecting leads. The best result of all? Four of their salespeople went from being average or below average performers to their TOP FOUR salespeople. And they didn’t stop there. This dealer applied the same technology to define which model(s) in their inventory represented the most defections specific to their salespeople so they could go after leads tied to underperforming models more aggressively. Model A represented the most opportunity for improvement, and again within 90 days, they increased closed sales specific to Model A by 51% and reduced defections by 30%. What we can conclude from the examples listed above, is that technology can help your people in a multitude of ways. Technology can help your salespeople close more deals and reduce their defection rates. Technology can help your people free up wasted time chasing leads from a faulty source. Technology can identify which models your people struggle with the most in order to boost specific model performance. Technology can even tell you if your customers are leaving your store to buy the same model somewhere else, or if they’re defecting to another brand entirely. But the most important thing to take away is that technology in the digital age still doesn’t sell cars. It can do a lot to light up the right track for your people to do just that, but at the end of the day your salespeople need to know your inventory like the back of their hand – what makes it better than competing brands or models, and what makes doing business with you a better option than anywhere else. The truth in a current landscape littered with lies is that there’s no way for any one dealer to know everything they need to know about their overall market, which models represent the most opportunity for their store, and if their salespeople are doing their jobs and following up with leads appropriately. That’s where the technology and data come into play. With a complete view of who is struggling and exactly what they’re struggling with during the initial contact and follow-up process, dealers can take immediate action to help their salespeople reduce defections and improve their performance across all facets of their sales operations – so they can be one of the 2.4 dealerships (at least) with a shot of winning the sale. Bice Chrysler Dodge Jeep Ram (Bice CDJR) had no way to accurately assess the performance of both their lead sources and their individual salespeople. In order to refine their sales and follow-up processes, they needed a solution that could measure their true success by looking at how many vehicles they sold, as well as the sales they lost to competing dealers. Click below to see how AutoHook helped this dealer increase their closed sales by 89% in just 90 days using a consultative approach combined with science-based technology. Check out the complete set of results!